Blade height (at heel): 2.14 in. 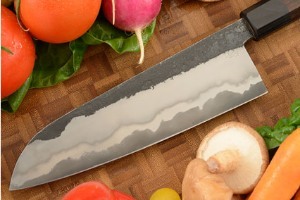 Description: Mastersmith Bill Burke's chef's knives are among the highest performing cutlery found anywhere. His heat treatment technique, combined with his choice of steel, results in edge holding that is far beyond other knives. 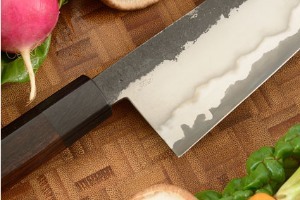 The santoku is the traditional Japanese chefs knife. This comfortable design is a fantastic multipurpose chopper. Santoku have quickly become the new favorite for chefs in the West. 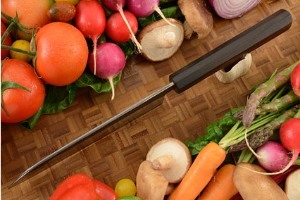 The 7-1/4 inch blade is easily controlled, while the tall blade gives plenty of finger clearance over a cutting board. From chopping to slicing, this will be your go-to knife. 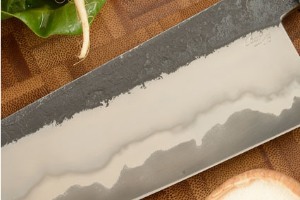 This blade is forged using a san mai (three layers) technique. Bill forged stainless steel to the sides of a 52100 carbon steel blade. The result is the exceptional edge holding of carbon steel with significantly easier care. Many knifemakers and users feel that 52100 is among the best, if not the best steel currently used for knifemaking. The transition line between stainless steel and carbon steel is exceptionally dramatic. When knives are hand forged, a natural black oxidation is left on the blade. The traditional black oxide (kurouchi finish) imparts limited rust resistance. Particular attention should be paid when washing kurouchi finished blades as a scouring pad can potentially wear off the black finish. 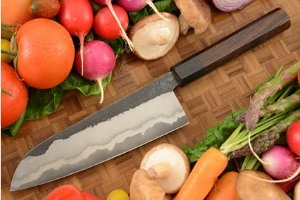 Because this knife is made from carbon steel, we recommend using camellia oil to avoid rust. 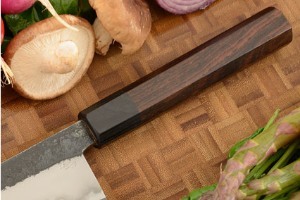 The traditional Japanese octagonal handle is formed from Macassar ebony (Diospyros celebica). This south east Asian hardwood has warm tones and a gently turning, straight grain. The ferrule is formed from black pakkawood. This traditional handle is very comfortable when used for extended periods and is a perfect choice for either professional or home kitchens. 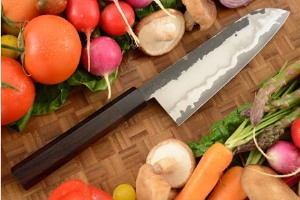 This is an incredibly high performance kitchen knife you won't want to put down! 0.3125 0.078125 312.5 78.125 Trailer Started.